So I started my new job today. I’m a judicial law clerk for state court in the county where I live. It was only day one but I can tell I’m going to LOVE this job. At this point there are two reasons I love it. First, I get health insurance at no cost to me. Second, my hours are 8:30 to 4:30. And when I leave at 4:30, I take no work home with me. Awwweeesooome! But its not all cake. I also only get all the state and federal holidays off work and only acculmulate a few days of vacation (not counting sick days) a year. 🙂 Ok. I lied. Those are pretty awesome things too. Especially for someone who has been in school for the last 23 years of their life. In case you’re wondering what I’ve done with myself this evening, since I had no work to catch-up on, I went to yoga class and the grocery store. It was nice. But here’s the big news… I did full wheel in class today! Let me explain why this is a big deal for me. 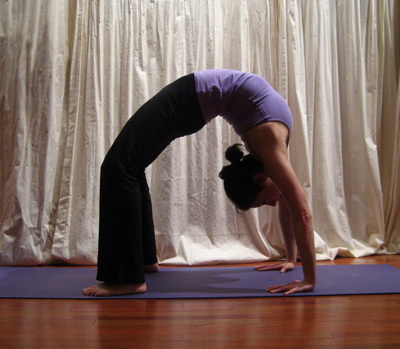 It’s not for the obvious reason that its a HUGE back-bend. It’s because I’ve always been afraid I will fall on my head and break my neck. Considering I’ve actually been doing this pose for years without falling and breaking my neck, it’s a little unreasonable. But it’s my fear and it’s been preventing me from doing this alone (I mean, without someone supporting my upper back when going in to it) for at least 3 years. Today though, I did it! I went from bridge to full wheel all myself. And, even though this may be obvious I didn’t fall and break my neck! I feel like this is a pretty big step for me. Maybe its symbolic of my new independent life? Or maybe it’s a sign of my freedom from all my obligations? Or maybe its a sign that I realized I’m not going to break my neck simply because I lift my upper back from ground… I’m not sure yet of the meaning, but I am sure that’s it’s exciting! Is that you? I can't tell.